Sally is a talented contortionist and handstand balancer. Her natural ability to bend herself in half and effortlessly balance on one hand or two has left audiences worldwide amazed. Sally has an excellent technical ability arising from her strong gymnastics background. She combines this with artistic creativity and an exciting stage presence to add something special to any event. Sally spent thirteen years training and competing in artistic gymnastics to a high level. She then trained in sports acrobatics and tumbling, competing nationally. 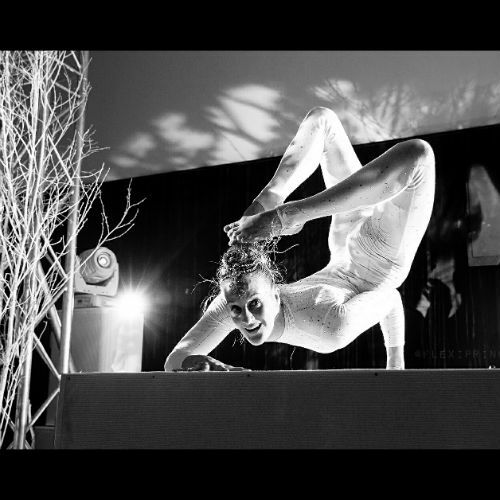 Since then, she has performed across the UK and internationally as a contortionist and handstand balancer, and with her aerial acts on the aerial hoop and static trapeze. This is an exquisite act of amazing balance, extraordinary flexibility, and skilled choreography. The act uses four tall and specially designed handstand canes. Sally balances on these tall handstand poles with spectacular ease and grace, performing many of her signature handstands and contorted positions. She also uses the floor space surrounding the canes to perform beautiful acrobatic movements. The act culminates with Sally squeezing all 5’6″ of herself into a tiny perspex box. Sally contorts and bends her body in half to form amazing shapes and positions. This is contortion and handstand balance moving from one spectacularly held position to another, performed on a platform or podium. It is also possible for Sally to include her contortion box into her sets, she somehow squeezes all 5’6″ of her into the tiny box! performing a splendid array of backflipping acrobatics and handstand contortion. Length of performances: For both Podium and Walkabout, performances are usually done in 1-4 sets of 10-15 minutes (depending on client requirements). It is also possible to do one set of podium or walkabout prior to performing one of her choreographed acts, for example as the guests arrive at the venue. Performance area: Podium contortion is best performed when raised on a stage/podium of 1-2 metres square/diameter. 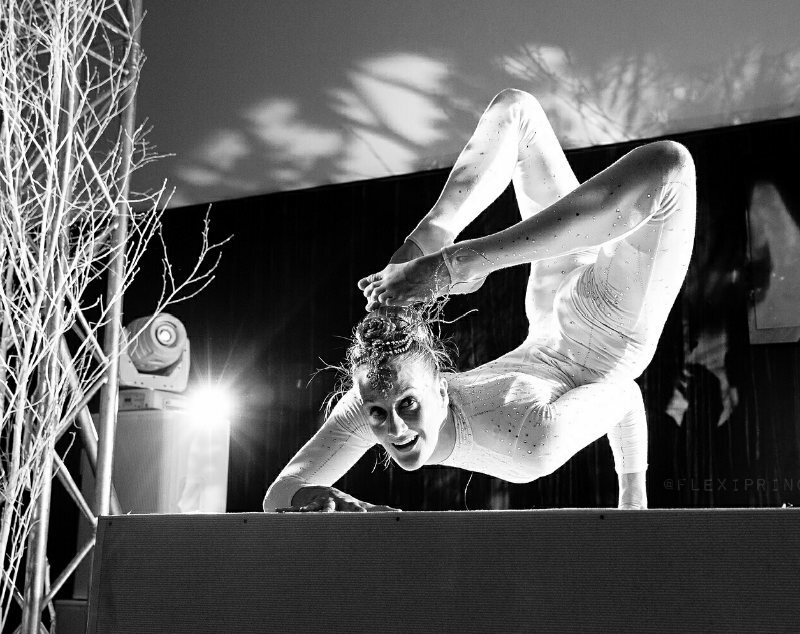 Sally and Lisa are a highly talented and experienced acrobalance and contortion duo. Their performances are both classy and creative and include duo contortion, hand to hand acrobatic balances, explosive back flips, and beautiful acrobatic movements. Thank you all for your help, the girls were amazing and fun to work with. I hope they enjoyed working with us. Please pass on my thanks to all of them and hope to work with you another time. The event on Friday went very well thank you. The entertainers were great and worked well together and delivered exactly what was asked of them. We would definitely hire them again. She was great worth the money and a delight to work with. Thanks for organising everything with such short notice, I really appreciate it. Yes, we were so pleased with Sally! She was brilliant and the guests were just amazed with her performance. Thank you again! The shoot went very well thanks and the trip out to the journalists’ offices got loads of coverage so we’re really happy. Sally was lovely and it was great to work with her.